It’s not about traffic. It’s not about website visitors or page views. It’s about conversions! 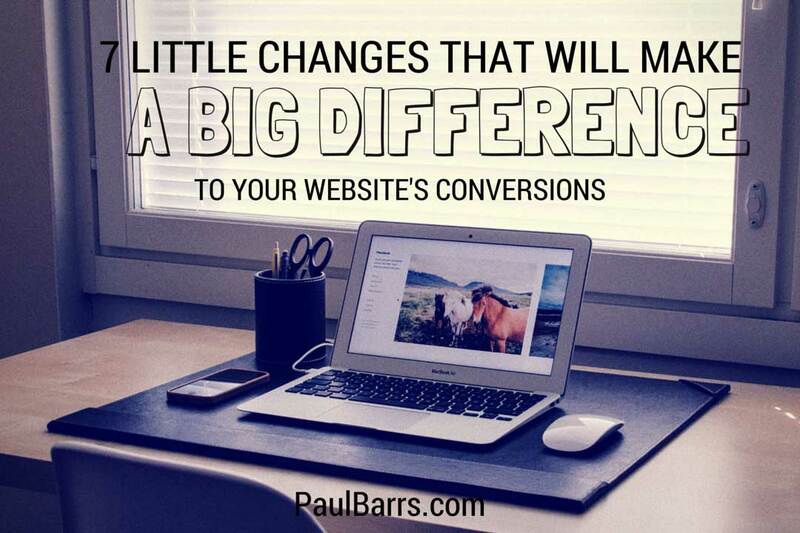 And here are 7 little things that will make a big difference to your website’s conversions… if you’ll just DO them. 7 little things that will make a big difference to your website’s conversions, wouldn’t they be good to know? Hi there my name is Paul Barrs from PaulBarrs.com, hello and welcome. Thank you for taking the time to come and join with me. Grab your pen and paper. Get ready to jot these things down because they are little things, they are things that you can actually do that will make a big difference to the conversions on your website. Number 1: Most importantly stop trying to sell on your home page. Unless of course your home pages is your only page but most likely it’s not. When people come to your home page its primary goal should be to help them find what they are looking for in an instant. It should be to guide them deeper into the website. To get them through to that first click to find what it is that they are looking for. It’s incredibly important. Don’t try and sell them on the home page. Use it to bring them and guide them further into the website. Number 2 on the list: Update all your meta titles and meta descriptions. 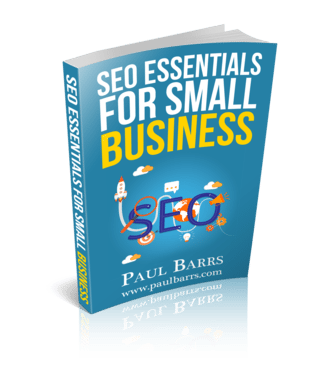 This is so important that you spend this extra time from an SEO point of view to update titles and descriptions. Why? Because most importantly this is what people see in search before they even click through to your website. You might have the great and the best content in the world and your website may well be ranking somewhere on the first page of Google but it’s of no purpose whatsoever if when someone sees your description, they go “Um, no that’s not what I’m looking for, let me click the other one”. So update your titles and descriptions. Number 3: Update all the page headings on your website as well. Usually that’s that H1 heading tag. It’s the name of the pipe that people see, the very first thing they see when they land on the website. Why? Because this is let’s people know that they’re in the right place. And if they feel that they’re in the right place, guess what? They’re gonna stick around to confirm it. So it’s incredibly important that not only you update the meta data for search to see how people see you but also, once they click through to your website that they come through again as well. Number 4: This is so important and so many people don’t do this. You need to define your website’s primary goals. What is it? What is it that you want for your website? What is it that you want from your customers? What are your primary goals? Maybe it’s a sale, maybe it’s a subscription, maybe it’s contact, maybe it’s a download of a document, whatever. What are the primary goals for your website? At least one, two, maybe even three. The magic of course happens when your goals match those of your customers. Number 5: Add a solid call to action to all your primary pages. Now I want you to go over every single page on your website. I want you to sit down, identify what are your primary pages, the most important pages on your website. The ones that if someone would come and look at them and go “Um, I’m learning about the business, I’m learning about the product, I’m learning about the person, whatever it might be“. It helps them learn about and builds trust for you within them. These are your primary pages. Create a solid call to action based on your goals for every single one of these pages. And let me just throw in, it doesn’t have to be right down at the bottom there somewhere, it can be 3 quarter, it can be half-way, it can even be a third of the way down. Different people make their buying decision at different times in the sale cycle. Number 6: Add a blog to your website if you haven’t already and if you have, update it frequently. Oh my goodness, this is so important! Because it’s very rare these days that people come to our website and they make a purchase from us straight away. They’re only those who already know what it is that they want. Everybody else though is still trying to decide. Normally what we want but who they’re going to buy it from. So you need to write a blog, you need to update regularly because when you get someone to your website, that’s the hard work done. Now you need to give them a reason to come back so they might see you in social or they might see you through remarketing or they might see you on somebody else’s website or they might see you through a newsletter that they’ve subscribed to. And it keeps bringing them back to updated fresh content. And number 7: The seventh little things, little changes that will make a big difference to your website’s conversions. Start using video. Oh please, start using video! It is such an important part. It is the major sticky factor. It is the thing that keeps people interested, qualified people on your pages longer. And it’s beautiful for building belief in you, in your product, in your service, in your business. Start using video. So they are 7 very small things I know. If you are not doing any of these, they’re not small. But grab your pen and paper, jot those things down. 7 things that can make them, you can do that will make a huge difference to your conversions strategies. I’ll talk to you soon. Bye-bye.